13/2/10 – Acquisition – Montargis, Musée Girodet – Always as active, the Musée de Montargis has once again expanded its collections with a splendid work by Girodet. The Portrait of Madame Reiset (ill. 1), executed with great virtuosity and revealing particularly delicate colours, was acquired from the La Scala Gallery in Paris ; this is the first feminine portrait to join the museum’s holdings. The model was married to Jacques-Louis-Etienne Reiset, a high-ranking employee of the Ministry of Finance, and had six children, including Frédéric Reiset who directed the Musées Nationaux between 1874 and 1879 as well as being an avid drawing collector. After having been purchased by the Duke of Aumale through Henri de Triqueti, the collection is now held at the Musée Condé in Chantilly. 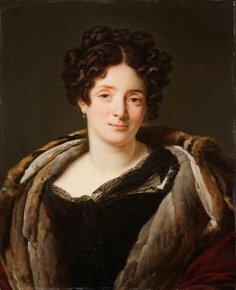 Madame Reiset was a musician and organized concerts and musical gatherings often attended by Girodet. 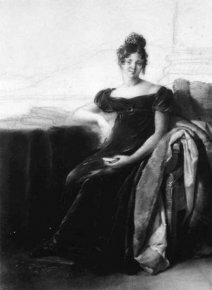 This portrait had remained in the Reiset family. A first version, dated 1823 and exhibited the following year at the Salon, is today at the Metropolitan Museum ; it was presented during the retrospective at the Louvre in 2005. Its conception is well known thanks to the correspondence between Girodet and his model. At one point, the possibility of doing a full-length portrait was discussed, but it was never completed although there exists a large preparatory drawing for it held in a private collection (ill. 2).